Author: Tekton Technologies (P) Ltd.
by MobiMonster Infotech Pvt. 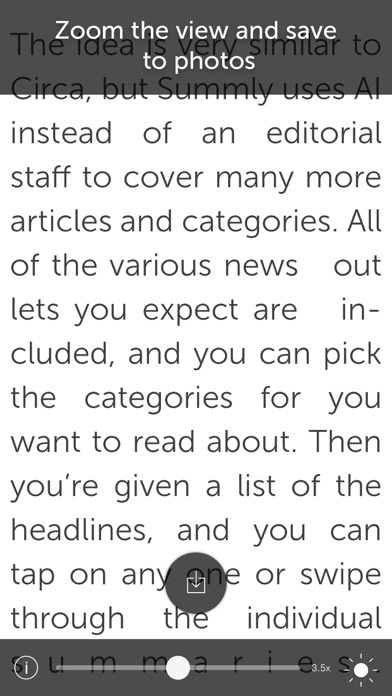 Ltd.
Did you forget to take your reading glasses or need a magnifier to read small text ? 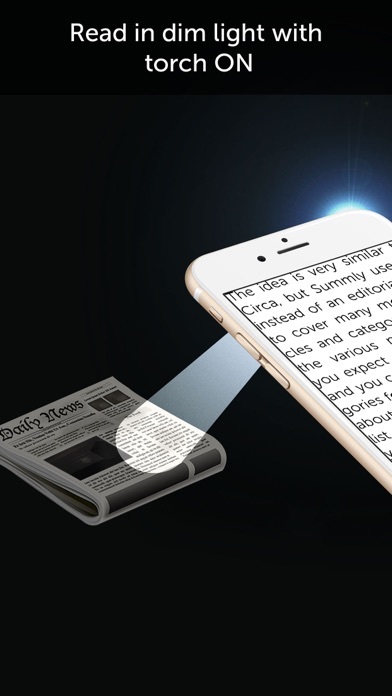 Just pick your iPhone to transform it instantly into a magnifying glass with flash light, that comes in Full screen with light and NO wasted screen space. The Magnifier Flash App is a very convenient and handy app, with such ease of use, that it operates with just one finger to slide to zoom, turn on flash light and also save to photos. And our users find it extremely useful for reading small prints in many occasions. Magnifier App is now enhanced with a tip calculator feature that is offered as an InApp purchase, that can come in quite handy, while checking out at restaurants. It calculates the tip per person as a percentage of the bill and also splits the tip between people. 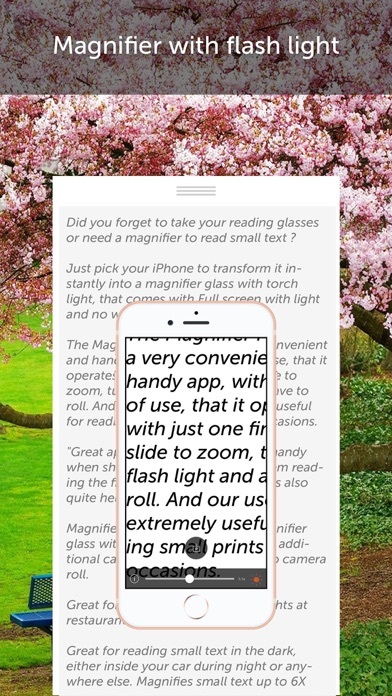 Magnifier Flash is an enhanced magnifying glass with flash light , with the additional capability  to SAVE what you see on the zoomed view to camera roll. Great for reading receipts in dim lights at restaurants. Great for reading small text in the dark, either inside your car during night or anywhere else. Magnifies small text up to 6X digital zoom, and gives a very clear text without shake. Single tap to "Snap and Save" the view to camera roll. 1. Magnifier with up to 6X zoom provide clear enlarged text of small prints or receipts. 2. Turn ON Flash light to read text in dim light or in the dark. 3. Easy to read nutrition label with small prints, as a high contrast crystal clear zoomed text. 4. Read restaurant menus in dim light very clearly and high contrast zoom. 5. Easy to find misplaced items in the dark or dim light. 6. Useful while searching for items in the car during the night. 7. Snap and SAVE what you see in the zoomed view on to the camera roll by clicking the save to photos button. Using this feature, you can later at any time view the photo or get it emailed to your desktop from your iPhone. It is a convenient and easy to use tool with a smooth slider, that calculates the tip per person, and takes into account standard tip percentages. Includes a tip round-off option. I needed to review a product bar code to obtain customer support. The font was 6 or smaller. Without this great app I could not have discerned the incredibly small letters. The flashlight illuminated the numbers wonderfully. Clean little app that is a godsend when I can't find my cheeter glasses. Esp in a dark cafe with tiny type on the menu! For the over 40 crowd with progressives when you reach the bottom of the lens and you still can make it out, this app comes to the rescue. Does exactly what it says. And quite well. Clear and quick macro for your camera. Easy to use and is perfect for close up work. This app is simple & works great. Have already used it to look at tiny screws on my glasses( which are hard to see when I have my glasses off to look at). Also great for finding that sliver that you can only feel. The sliding power level is a real plus. If you need to write little texts or make a macro picture of something  this app it's  for you. Love it. Thank you for this app! I use it often. I'm always forgetting my glasses. This is so handy in reading labels, receipts when eating out, and the light is a bonus when in dim areas. The view is sharp and light is bright on the iPhone 5. Full screen with light. No wasted screen space. Good for reading menus in dim lit restaurants. Toolkit Free – Flash Light, Battery Saver etc.